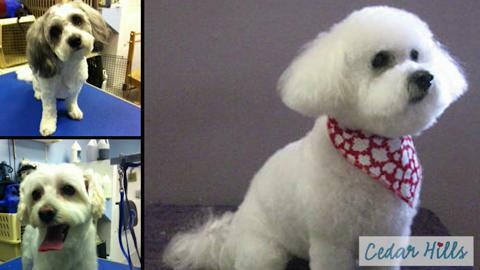 For over 20 years Cedar Hills Pet Grooming Centre has provided top quality grooming services for your pets. We pride ourselves on making your furry friends look their best at affordable prices. Your pets will receive complete grooming in a warm and relaxing environment. This is a very honest review. This place is horrible had the worst experience ever for my pup. They are just doing fast choppy cuts uneven all over. I would suggest you do your own dog's cut then let these bad owners touch your pet. They treat other dogs very bad telling them shut-up out loud so un professional. I have tried many groomers in my area and found the girls at Cedar Hills to be very compassionate, gentle and calm with my pet. Their cost is affordable and they were very thorough. I have always been very confused about what my pet type of clip my pet should have, they took the time to go over different ones with me and most of all they were very honest about what would work for my pet. I was very pleased to see my dog come out at the end of the day very happy, and looking and smelling great. Not happy that they didn't ask how short I wanted his hair cut. I wanted his hair cut shorter than what they did. Especially the paws. They did have my dog done within four hours which is still a bit long in my mind but at least it wasn't all day. I'm very happy that they did an excellent job on cleaning his ears and they make sure to not get water in his ears as my dog is prone to getting ear infections. They put cotton balls in his ear so no water gets in them. So I like how they are diligent. There's a lot of lose hair flying around and felt that the place could be a little more cleaner. Over all I was pretty satisfied. The BEST dog Groomers in all of Surrey!!! My wife and I recently moved to the cedar hills area and have tried several groomers over the last few months. Friends of ours recommended this salon to us as they have taken all their pets to these groomers over the years. Our dog is very skiddish, and can be shy towards certain people. We explained our situation to the groomers upon arriving, they were very concerned. As the groomer approached she was very calm and was very happy. To our amazement our dog seemed very relaxed. She had spent a little time with him before she took him to the back. When we came to pick up our dog. We were told all went well. As bailey came out to us, he was very happy. I highly recommend cedar hills grooming. The staff at Cedar Hills Grooming are fantastic! Very reasonable prices and quality service and care means I'm very happy and my dog is too! If you are looking for pet grooming services, Cedar Hills is the place to call! The girls in the salon were very happy and dedicated to their work. My dog has had many skin issues over the years and they suggested a proper diet and regular grooming, along with some veterinary care, his skin is alot better. i highly recommend them. I have always had a hard time finding a good groomer for my pet. Other salons never took the time to listen to what my pets needs were. The girls at this salon are very friendly, happy and I never feel that I am being rushed when I drop of my dog. They have always answered any questions I have had concerning my pet. Best of all my dog leaves the salon very happy, smelling and looking his best. I would highly recommend this salon to any one.